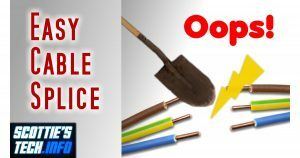 If you’ve ever accidentally chopped through a wire or electrical cable, you know how much fun it can be to try to repair it so that it stays waterproof, dust proof, weatherproof, etc. I recently had just such a fun experience myself. It turns out that there are quite a few nice products out there to make the splicing process WAAAAY easier. Keep in mind that the type of splice you use depends greatly on the application – and even the type of wire (solid vs stranded). A wire splice for an automotive-type application must be pretty strong, because vibration is obviously an issue. An underground electrical cable doesn’t have to withstand vibration, but it definitely needs to be waterproof! Note that I forgot to mention one product in the video: 3M Scotchlok connectors. They are good for wires up to 1.5mm2, and they’re water resistant. But, they may not be very good for high-vibration applications due to the way the blades inside bite into the copper wires. These are the same type of connectors your phone company tech usually uses for phone line wire connections, only bigger. If you know of any other solutions, lemme know!